Head over to Amazon and download this Family Bible Study :: Being A Good Helper for your Kindle (PC or Mobile device too)! 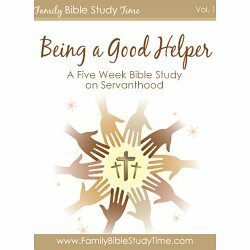 In this practical Family Bible Study eBook you will find 5 weekly family Bible Studies surrounding a the theme of being a good helper, or servant hood. Each week your family will study a snippet of scripture, find a short commentary of the scripture (or thoughts to share), an activity, discussion questions, and a family virtue you can use for your wall of virtue. **Note this was FREE at the time of posting, but because Amazon changes prices frequently, please make sure it's still free before purchasing.